We are preparing to go south for some much needed rest and relaxation before the start of the 2013 season at our bed and breakfast. Although we may be closed, you know I will continue my search for great wines to serve our guest. Even as I plan ahead, I looked back on the wonderful year we had in 2012 and the great wines I was fortunate enough to enjoy. 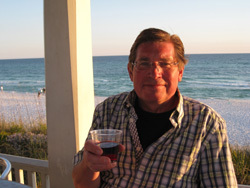 Wine wise, last season started off great with a very nice article in the May issue of Cape Cod Life magazine entitled "An Impromptu Tasting with Charlie Preus". The article recounted how much I enjoy when friends spontaneously stop by the Inn to share a bottle of their favorite wines with Jan and me. Last year, as one of our best seasons ever came to a close, I was treated to one of the best impromptu tasting I have ever experienced. Our friend Spencer Knowles from Horizon Beverage Company had his parents stay at our Inn to enjoy the seasonal experience of Gardens Aglow at Heritage Museums and Gardens just up the road from us. He reached into his personal cellar to share and, since he is a wine professional, that means it was a very special treat for all of us. With appetizers of cheese and fruit, we started with a very unique Chilean Syrah, the 2007 Montes Folly. As always, Spencer gave lively background information about the wine. I recognized the Montes name from a number of tastings we have done over the years. Montes Premium Wines was an early pioneer in Chile and some say is responsible for the respect that Chilean wins have gained worldwide. In 2000, the founder, Aurelio Montes, created a very limited production 100% Syrah from grapes planted on extreme slops at very high elevations on the Estate. Some said it was a crazy idea and thus Montes Folly was born. The wine has evolved and is now considered ‘Chile’s first ultra-premium Syrah’. From my tasting of the 2007, I agree with the praise and as I learned with a little research, each vintage also has a beautiful original label created by the artist Ralph Steadman, which adds a little extra visual pleasure to the wine. Jan and I stayed home and tended the fire, ok we watched the gas log, as the Knowles’ family braved the freezing weather to take in the lights at the festive Heritage Gardens. Upon their return we ordered pizza and Spencer shocked me with his next cellar selection as we waited for our local Emelia’s Pizza to deliver the pies. As many oenophiles do, in December I look forward to Wine Spectator’s annual edition that presents their pick of ‘The Top 100’ wines of the year. I always check to see which ones I have already had and, in years past, I would go out and buy as many as I could find in my price range to put in my cellar. I have to admit that since working with my friends at Cellar 55 Wine Merchants, I have now actually touched the bottles of some of the highest rated and most expensive wines from past lists, even if I have not tasted them yet. So, what a pleasant surprise when Spencer opened a Shafer 2008 Napa Valley Relentless, Wine Spectator’s Wine of the Year for 2012. 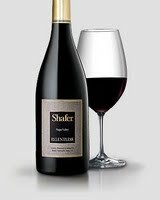 John Shafer has been famous for his Napa Valley Cabernets for years, but Relentless is a wonderful blend of Syrah and Petite Sirah. Wine Spectator also praised Relentless as an example of the ascendance of Rhone-styled wines in California, based on grapes other than the historically traditional Merlot and Cabernet. I am not sure of all that hype, but with only a small production of 3,300 cases and the increased demand that comes from a Wine of the Year award, I am overwhelmed that I had the pleasure of sharing this great wine. As if Relentless wasn’t enough, when the pizza arrived, Spence opened a magnum of Mauritson Rockpile Ridge Zinfandel. Earlier in the year we did a Mauritson tasting of which the Rockpile was the star. We finished the evening with great pizza matched with a great Zinfandel. What a perfect way to end a great year at our Sandwich Inn with another magnificent impromptu wine tasting with friends. Come and stay with us this new season and perhaps one of these tastings will occur, I promise you it will be an experience you will not soon forget.